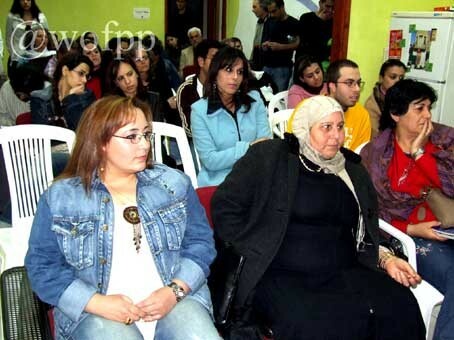 Haifa – by Rasha Haloa - On Wednesday, 7 March 2007, on the occasion of the International Women's Day, "Women for Political Prisoners" and the "Association for Arab Youths – Baladna" organized an event of solidarity with the political women prisoners in the jails of the Israeli occupation. Lawyer Taghreed Jahshan introduced the event by exposing statistical facts and figures about male and female prisoners; she talked about the prison conditions, about the daily suffering and about solidarity activities on behalf of the prisoners, women and men. Lawyer Jahshan pointed out that today there are over 10.000 political prisoners in the jails, among them 120 women. Most of the women prisoners are held in Hasharon Prison, the others in Neve Tirza (Ramle), in Jalame Prison and in various detention centers. Some of the women are constantly being transferred from one prison to another, a fact that adds suffering to the prison conditions that are harsh to begin with and to the unpleasant and humiliating treatment at the hand of the prison authorities. 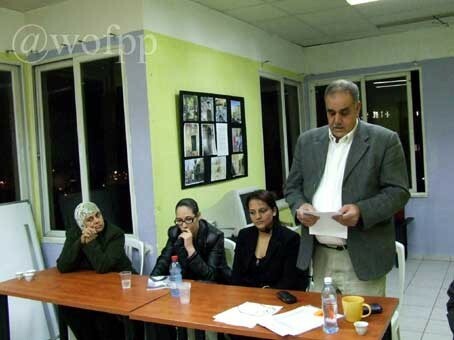 The released prisoner Arij Shakhbari from Nazareth talked about her experience in jail, about the suffering of the women during the long, humiliating interrogations by the General Security Service and the suffering in prison due to the harsh detention conditions. Arij also talked about the women organizing their struggle. The Jewish liberated prisoner Tali Fahima briefly talked about her experiencesand emphasized the fact that her suffering was negligible compared with the suffering of the Palestinian prisoners, and that they were first and foremost entitled to talk about their experiences and about the humiliating treatment of the prison authorities, a fact that is practically unknown by the Jewish society. She added that today she is active in order to acquaint the Jewish public with this topic. Mister Muhammad Sa'adi from Sakhnin, the father of the two women prisoners Buhaisah (released) and Taghreed (still in prison) read a moving letter that his imprisoned daughter (who is also a poetess) wrote for the event, addressed to the Palestinian women wishing them to obtain their freedom. The mother of the prisoner Su'ad Abu Hamed from Nazareth talked about the suffering of the families whose daughters are imprisoned, and particularly about the difficulties concerning the visits and the humiliating searches, and about the transfer of her daughter from prison to prison, without the family being informed of her whereabouts. 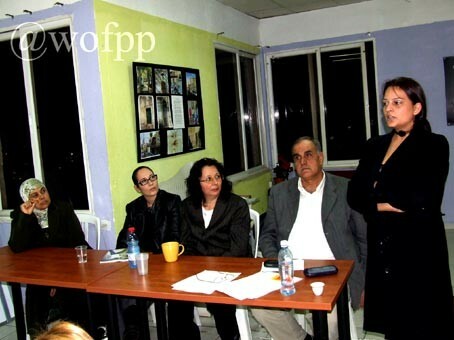 Diana Hasin from Deir Hana, mother of the male political prisoner Rabia Hasin, imprisoned for the last five and a half years (since he was 16), concluded the evening. She talked about her activities in the association "Ansar Alsajin" (An association for the prisoners) that took care of prisoners. The association attacked and closed down by the Israeli authorities. She also emphasized the suffering of the families, as well as the hardship of the prisoners and the intimidation they suffer at the hand of the prison authorities.